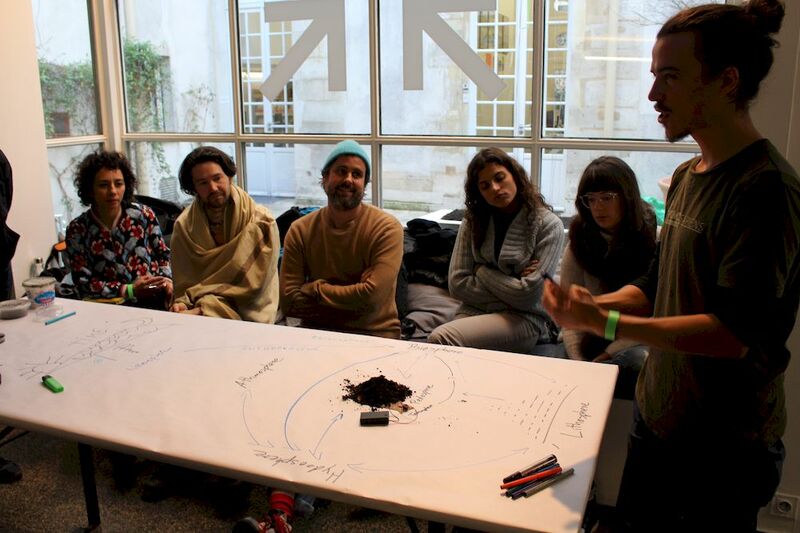 The Swiss Cultural Center hosted Seeds&Soil, three days of exchanges around this eponymous theme, on March 6-8. 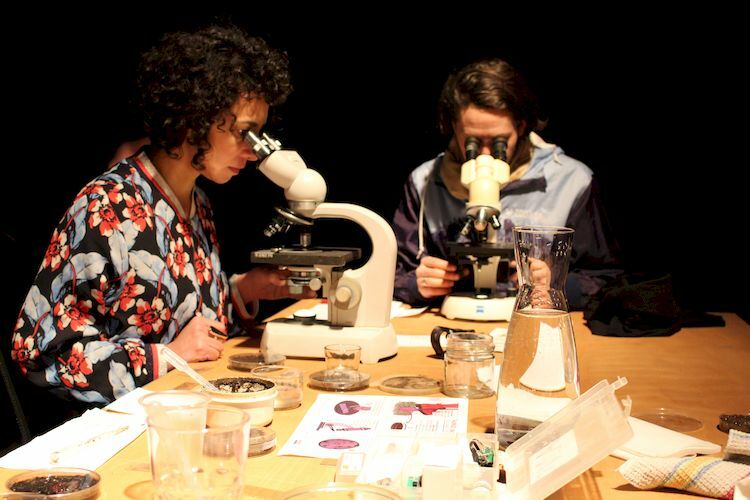 Makery participated in Mikrobiomik’s “Open Soil Research” workshop to observe the microscopic biodiversity of soils. Report in photos. 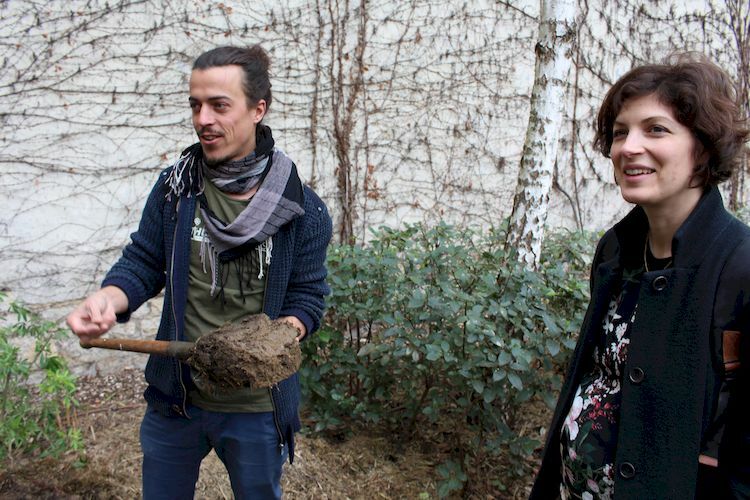 On March 6, 7 and 8 in Paris, Claire Hoffmann and Yvonne Volkart from the Swiss Cultural Center presented Seeds&Soil, a program of talks, workshops and screenings around the touchy topic of the degrading biodiversity and decreasing richness of soils. Both theoretical and practical, the program focused on care—for seeds, plants, gardens, soils, forgotten areas, invisible life. 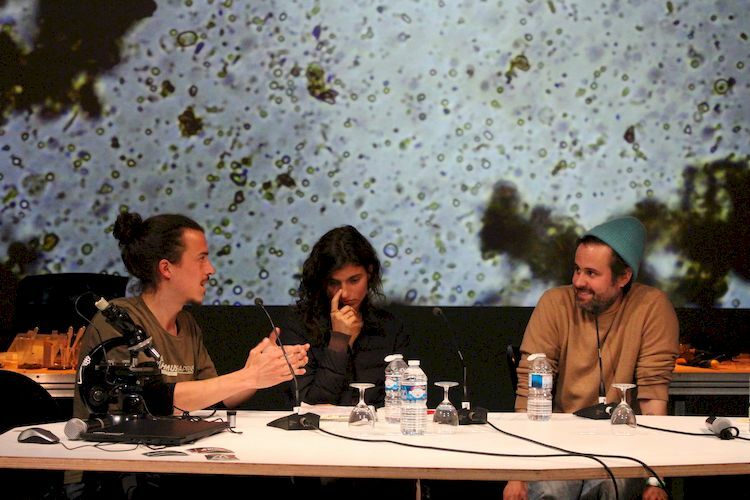 “We need to stay optimistic,” said Julian Chollet, founder of Mikrobiomik, member of the Hackteria network and researcher in microbiology and molecular biology at Bauhaus-University Weimar, during the round-table that followed Friday’s soil observation workshop. Julian Chollet presents Mikrobiomik. 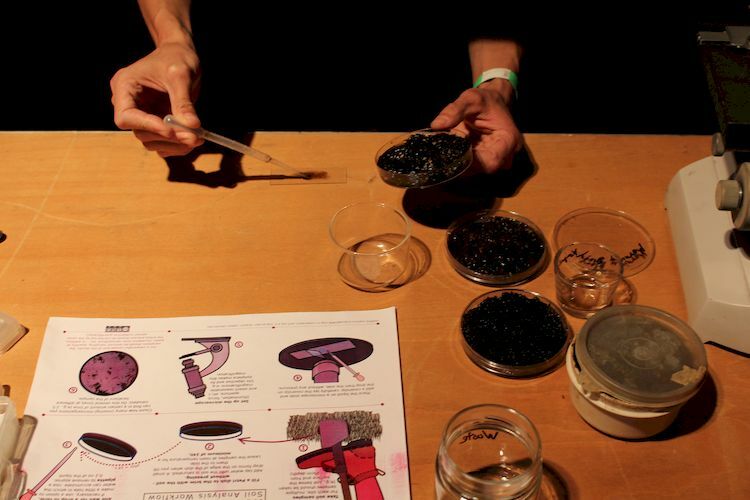 The group also offers workshops on fermentation. Julian Chollet, Ariane Leblanc and Pedro Wirz. In a talk with Ariane Leblanc from La Semeuse in Aubervilliers in France and Pedro Wirz, who is presenting his work at the Swiss Cultural Center through March 24, Chollet encouraged us to rise above the apathy for the environmental crisis and get involved in collective dynamics for sharing knowledge and skills. A large part of the audience had just emerged from the three-hour “Open Soil Research” workshop. 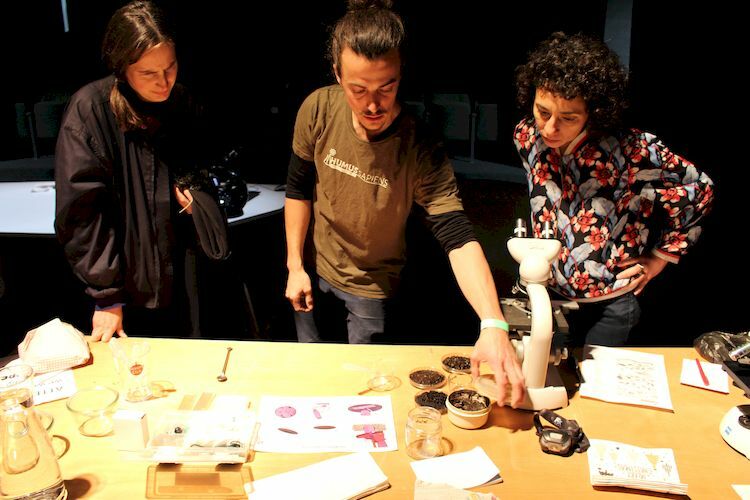 The “Open Soil Research” format first came about in September 2017 during Hackteria’s Klöntal Biohack Retreat, in which Taiwanese bioartists, Swedish open hardware designers, Swiss biochemists, fermentation fans and other curious and interdisciplinary minds came together in a welcoming valley in the Swiss mountains. Organized by Maya Minder and Marc Dusseiller of Hackteria (whom Makery previously interviewed at length), the event provided a space for participants to share their common interest and enthusiasm for life sciences. 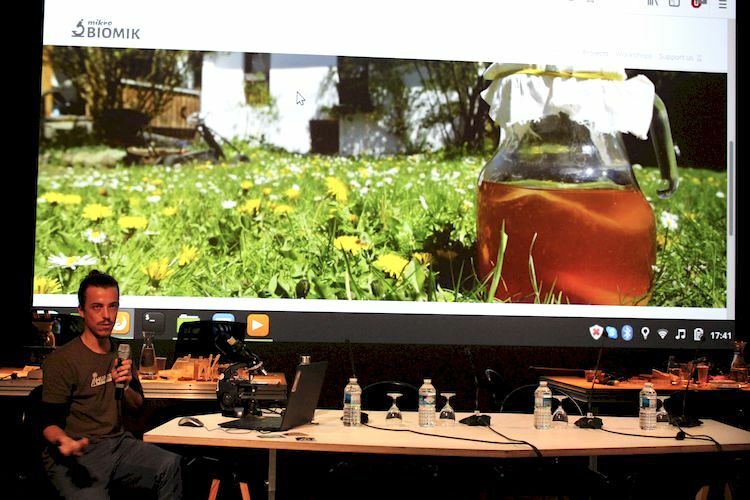 One of the topics was soil, and Julian Chollet from Mikrobiomik proposed to compare the soil of your own garden with samples from the mountains. For the following three days, many participants took the challenge to heart and studied their soils. 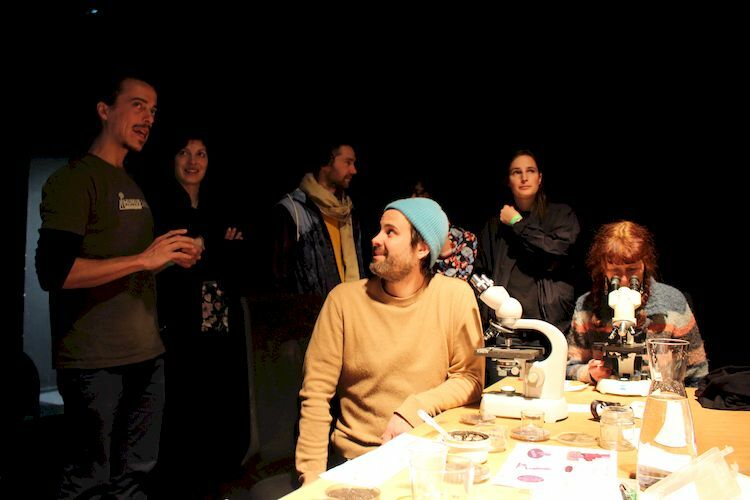 In January 2018, during their winter meeting, Hackteria and Mikrobiomik agreed to organize two retreats entitled “Humus Sapiens – Open Soil Research” that same year: one in May near Schaffhausen in Switzerland, the other in July at Projekt Draussen about 30km outside Munich (which Makery included in our 2018 map of summer camps). A detailed wiki documents the Mikrobiomik summer camp. 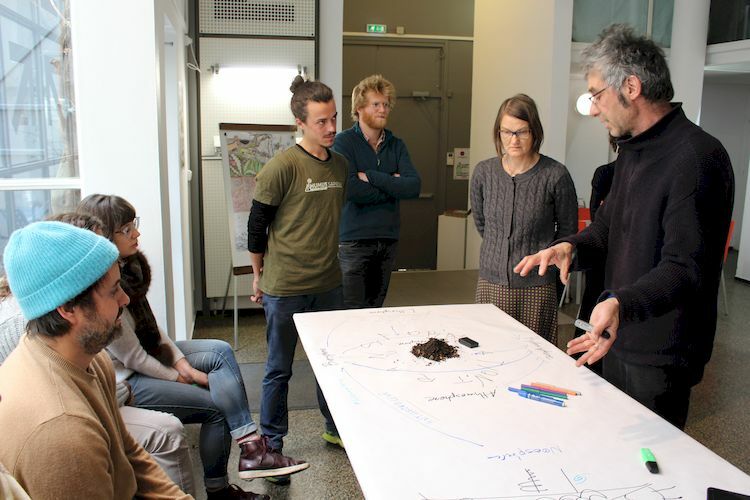 So in March 2019, Chollet adapted the format of these Open Soil Research retreats for a three-hour workshop at the Swiss Cultural Center. 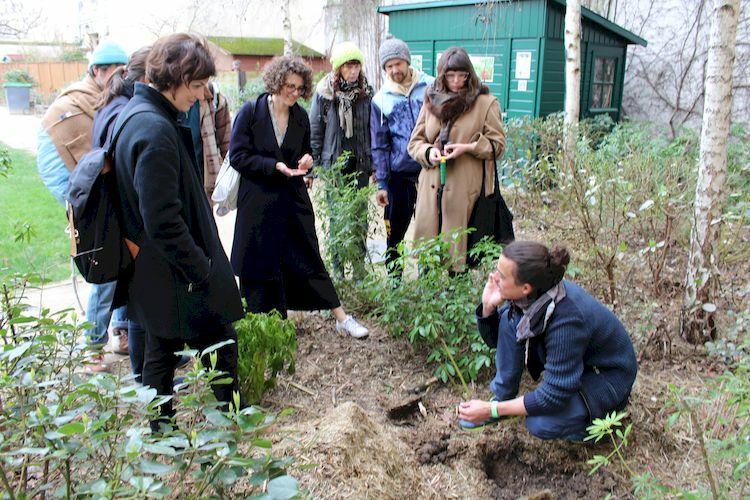 The idea was to stimulate curiosity for the invisible life of soils, composting, urban gardens, bioremediation, permaculture and the condition of soils sampled by the participants in the neighborhood of Rue des Rosiers. The first hour was spent spontaneously mapping various “spheres” that make up life on land and discussing how these spheres are interrelated. The emphasis was on the pedosphere, the most external layer of the Earth’s crust, the thin superficial membrane of the soils, situated in the interface between the lithosphere (Earth’s crust), the atmosphere, the hydrosphere and the biosphere. 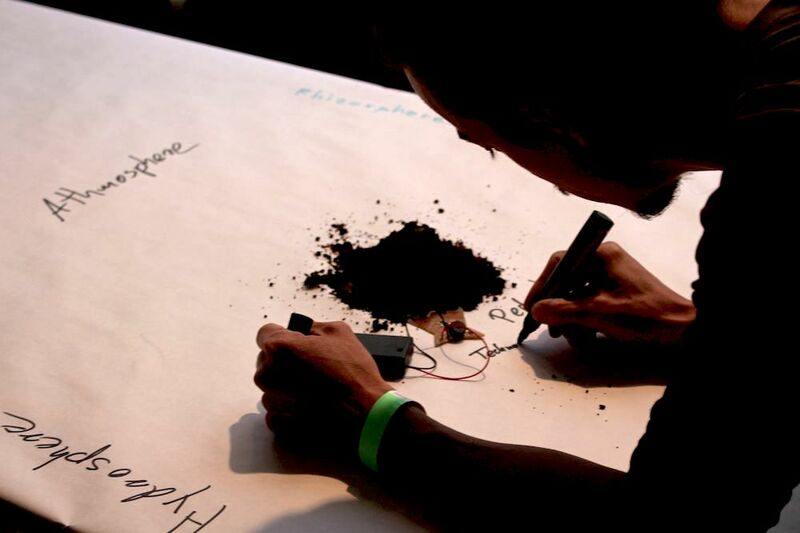 Participants discussed the impact on soils of the human technosphere and its plastic, electronic and chemical waste. The conversation covered the transformation process of soils and associated timeframes, such as the relatively short timespan, on a planetary scale, of the presence and impact of human beings, which is generally associated with the term “Anthropocene”. The 20 participants more or less agreed that the term “anthropo-centric” is rather inaccurate given the timespans represented by the soils. The technosphere is a concept, created by Vladimir Vernadsky, which designates the physical part of the environment affected by human-induced changes. The question of time came up often when discussing human impact. 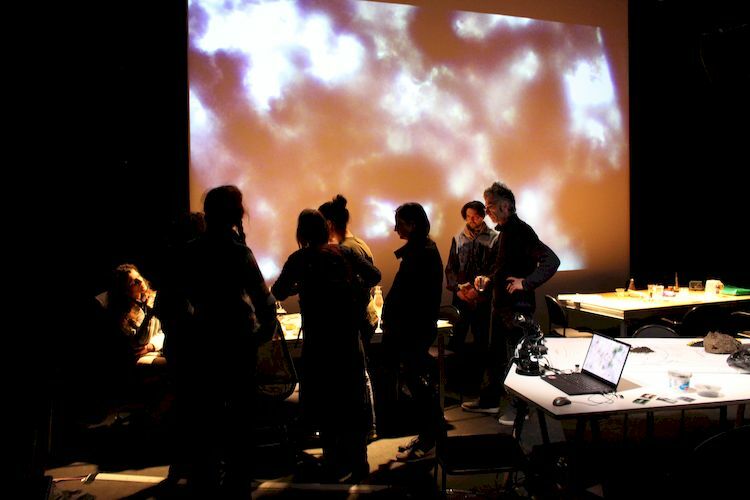 Through this exercise, Julian Chollet wants to show that everything is interrelated. 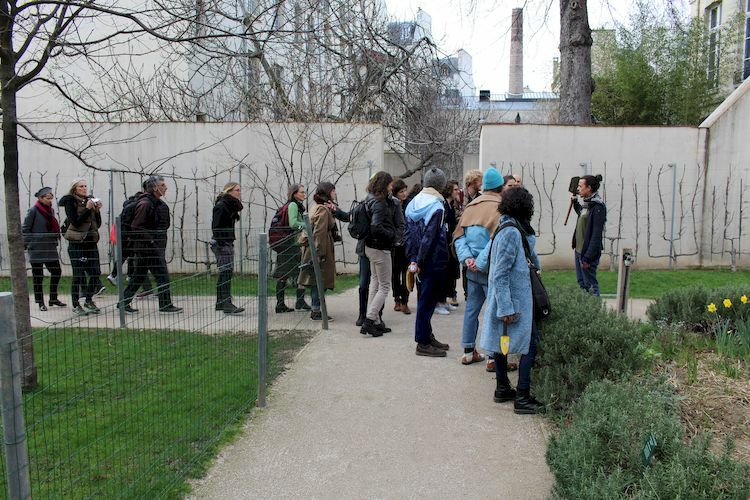 The second hour was spent exploring soil samples collected from around the Swiss Cultural Center, focusing on meager sprouts of vegetation and presences of soil in the Marais neighborhood, with a more in-depth stop at the Rosiers-Joseph Migneret Garden, which has had composting bins for the past three years. The community garden is collectively cultivated, and the harvest is shared among all the members. 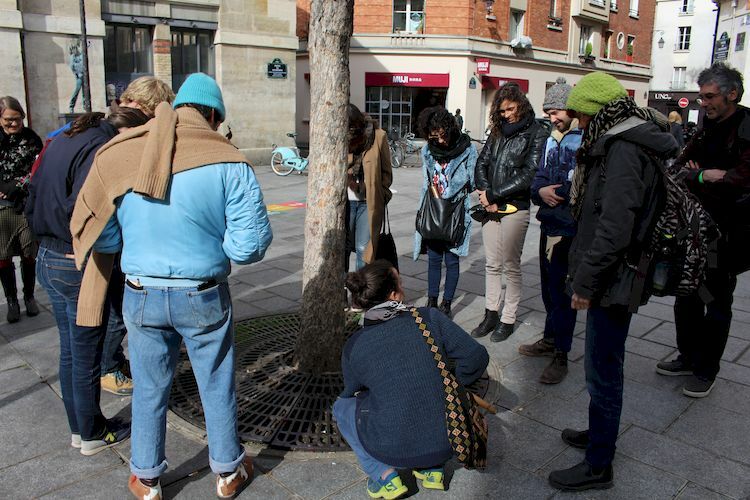 Stopping to examine the soil at the base of trees on the new pedestrian plaza. Beginning of sample collection at the Rosiers-Joseph Migneret Garden. 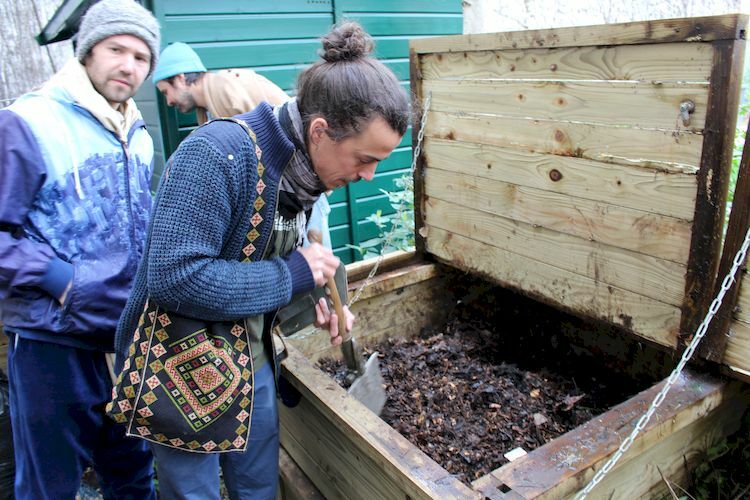 The compost will be particularly interesting to observe. Collecting soil in the garden. 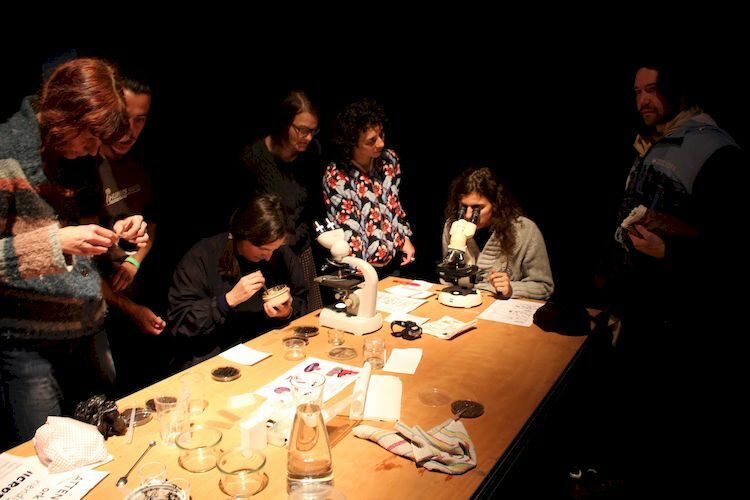 Finally, during the last hour the participants returned to the Swiss Cultural Center to observe under the microscope the collected samples, as well as the samples brought from home. 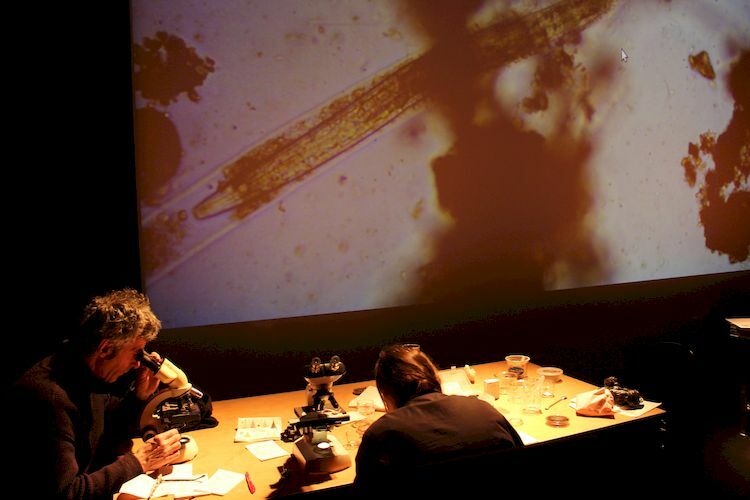 It was an opportunity to examine more closely the microscopic biodiversity in soil (nematodes, ciliates, bacteria, etc. ), which plays a fundamental role in the production and maintenance of humus. Preparing the samples for the microscope. After moistening the soil, we take a sample of liquid from the edge of the petri dish. Everyone examines their own soil. A nematode inside another nematode! Julian Chollet describes the different types of species and organisms observed. The workshop concludes after offering an introductory approach to the little-known world of soils. More info on the Seeds&Soil program and on Humus Sapiens and Mikrobiomik.